I’ve written before about my yearly tradition of doing different things each thanksgiving food wise. This year I’ll be doing my quail recipe but will also be doing a prime rib roast. I’m very excited about this because it’s the first time I’ve gotten the roast far in advance to dry age it in the fridge. Aging the meat allows for natural enzymes to break down the muscle tissue of the meat. In addition the meat becomes dehydrated slowly, leaving behind a much more flavorful steak. 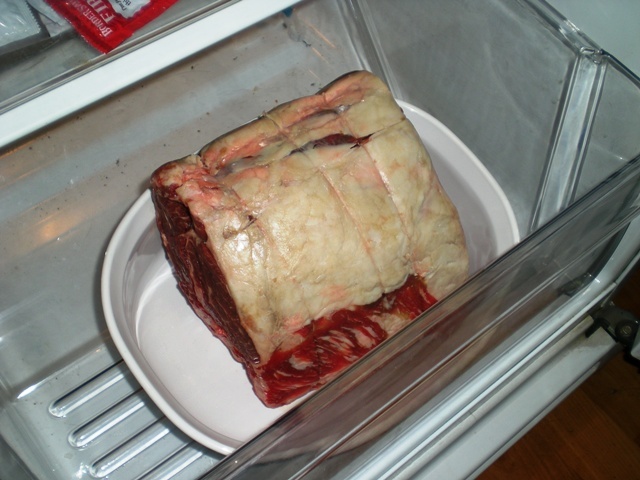 Now, there’s a lot of opinion in general about dry aging your meat yourself. Almost all the meat you’re going to get at retail grocery stores is wet aged. That means basically it’s been sitting in a vacuum sealed crypack in a fridge in with its own blood. Yes, that helps, and it reduces the volume of meat lost to dehydration and having to trim the aged cut to remove the non-edible bits. If you buy your meat from a specialty butcher you can often request they do the dry aging themselves. This is preferable because aging meat actually requires a relatively specialized environment, with specific humidity and air flow for optimal results. However I’ve been told by numerous cooks you can achieve the desired effect yourself if you’re willing to go through the trouble. So I’m going to try it! WARNING: doing this you accept the risk that you’re going to ruin a perfectly good (and expensive! )piece of meat. If your fridge isn’t clean or there’s something oderous in it like onions or something the meat might pick that up as it ages. We start off with a 5.5 pound standing USDA choice rib roast. Prime would be better, but since it’s pretty hard to find, Choice works. You can get this from a butcher or Costco. It’s very rare to find a decent cut quality from a major chain unless it’s a boutique one like Whole Foods. I’ve been advised not to try this with USDA Select so know your meats! Unwrap the meat and rinse it and pat it dry. Find a nice dish that you can keep it in, but it’s going to age uncovered. Again there is some debate about aging it yourself whether you cover it in a cloth or not, we’re going commando for this one. My fridge has seperate temperature and other controls. So we’re going to place the roast in the meat storage drawer at the bottom of the fridge, and set that temperature range for somewhere between 36-40 degrees. Put it in, close the drawer. Now it sits until Thursday morning. I’ll check on it of course during that time to remove drippings trade out the dish, etc. On Thursday morning I’ll remove it, then it has to have all the dried bits and gunk trimmed off of it. I’ll photo that process as well. Then it goes into the oven for a slow roast at 200 or 225. Once it’s complete and I’ve verified I didn’t ruin it I’ll write this one up as a recipe file. I hope it turns out like I think it might!